Driving in Seoul is almost always a hassle due to massive traffic jams and reckless drivers, so it would be fair to say that futuristic autonomous driving technologies could face many challenges here. However, the idea of sitting behind the wheel without human inputs is getting closer to reality, with a self-driving car successfully driving through the crowded streets of Seoul without a hitch. 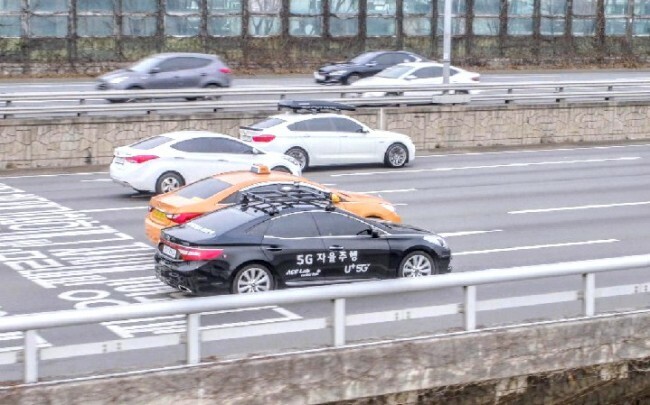 South Korean telecom company LG Uplus and Hanyang University’s research team on Monday demonstrated autonomous driving equivalent to level four. Powered by the company’s 5G wireless network, the self-driving car traveled about 8 kilometers alongside ordinary vehicles. Dubbed “A1,” the autonomous vehicle was developed by the Automotive Control and Electronics Laboratory at Hanyang University. The research institute integrated its self-driving technology into LG Uplus’s 5G network on a car manufactured by Hyundai Motor. Upon switching on the autonomous driving mode, the car kicked off its 25-minute journey at Seongsu-dong, eastern Seoul. It left on its own without any driver inputs. When the car was nearing the entrance of Gangbyeon Expressway, it slowed down and automatically changed lanes. It cruised along the Han River as ordinary drivers alongside stared on with curiosity. Having traveled below the speed limit of 80 kilometers per hour, the car returned to the starting point without incident. Throughout its journey, the vehicle maintained a proper distance with other cars for safety. “Previous demonstrations for autonomous driving were carried out in controlled environments,” said Sunwoo Myung-ho, a professor who studied autonomous driving at Hanyang University and prepared for the demonstration with LG Uplus. LG Uplus’ competitors -- SK Telecom and KT -- carried out their own demonstrations of self-driving cars last year. KT conducted a demonstration at the 2018 PyeongChang Winter Olympics and SK Telecom followed suit in November last year. But LG Uplus said its self-driving car demonstrated more seamless autonomous driving by “taking full advantage” of 5G technology, which enables real-time delivery of traffic information and communication with the control center. “In the previous 4G environment, autonomous vehicles could receive critical traffic information after traveling 2.8 meters. 5G technology can reduce it down to 1 millimeter,” said Kang Jong-oh, who manages future technology at LG Uplus. According to the telecom company, Monday’s demonstration was equivalent to level 4 autonomous driving, which means self-driving is supported only under special circumstances like traffic jams. Equipped with advance sensors and cameras, the vehicle appeared to drive seamlessly by detecting traffic signs and other vehicles’ movement. The car’s “LIDAR” system helped navigate through challenging traffic environment, such as dark tunnels. In the meantime, 5G-powered global positioning system provided accurate geographic information. According to LG Uplus, the self-driving vehicle can figure out even a centimeter difference in street lanes. According to the company, there are about 60 self-driving cars operating in Korea, including the one demonstrated on Monday. All of them are allowed to hit the road if approved by the government in advance. Professor Sunwoo of Hanyang University said while Korea’s autonomous driving technology is advanced enough to compete with global tech giants, there is still a long way to go due to government’s regulations. According to the professor, collecting massive data is key to advancing self-driving technology. However, the amount of data collected from 60 self-driving vehicles can be much smaller than global tech giants such as Google. “Google’s subsidiary Waymo is seeking to mass-produce autonomous vehicles -- up to 60,000. It means we have to run our self-driving cars 1,000 times more than Google. There is a long road ahead,” said Sunwoo.